Today is a sad, sad day for all Canadians – and a tragic one for all freedom loving people. "It is the finding of this Tribunal that truth is not an issue before us. Parliament has spoken. The use of telephone messages for purposes prohibited by Section 13 of the Act cannot be justified by asserting that such messages are truthful. The sole issue is whether such communications are likely to expose a person or persons to hatred or contempt." 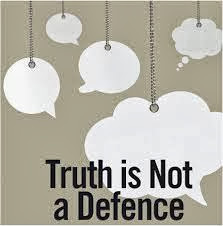 In summary, the Commissioner Pensa determined that “truth is no defense,” or in other words in any case before that quasi-judicial body – the Human Rights Tribunal “truth doesn’t matter.” It seems that the absurd statement “truth is no defense” has crept into the regular court system in this 21st Century. Read Mark Weber's article: "The Importance of the Zundel Hearing in Toronto." A most important cyber-defamation case – “Warman vs Fournieret al” began on September 9, 2013 and ended on October 2, 2013 at a civil court in Ottawa, Ontario, Canada. The verdict by the jury in the “Warman vs Fournier et al” has effectively killed good, old-fashioned, political discourse and debate in cyberspace, in Canada. Even minor insults and common hyperbole of innocent nature and made-up words not in the dictionary, can now be construed as defamation. Each and every Canadian ought to now be motivated to action in a gallant effort to redeem free speech in Canada. 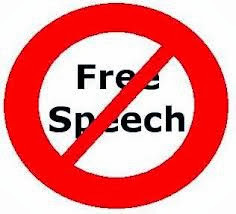 Most likely, our elected representatives are not yet aware of the significant impact that the verdict in the Warman vs Fournier et al is having on our fragile and ever diminishing right of free speech in Canada. Canadians everywhere are invited and encouraged to communicate with their respective, elected Members of Parliament re: Canada's oppressive and outdated libel laws and the outcome of the "Warman vs Fournier et al" trial. Read Jeffrey Sahllit’s article: "It's time to reform Canadianlibel law"
And Alan Shanoff’s article: "Timeto abolish outdated defamatory libel offence"
To redeem free speech in Canada, the libel laws must be revised to modernize the original words of the Magna Carta that was written in the 13th Century when King John was the feared enemy of freedom and liberty. In retrospect, perhaps the six member jury would have returned with a different verdict if the Plaintiff’s responsibility was to prove that the statements were typed with malicious intent. In this 21st Century, the power of the Plaintiff in a cyber-defamation case becomes the feared despot to freedom of speech. “The witnesses we brought in were to prove specific facts that we needed to prove were true in order for a fair comment defense to apply. The fair comment defense doesn't apply if the comment is not based on "proven facts". Since there were specific comments about a protest at Paul Fromm's house and about events with David Icke so we needed them to give testimony about them. Newspaper articles and even tribunal transcripts were considered hearsay and much of the evidence we brought was excluded by the judge. You cannot prove a fact in court unless you call a real person who was there. So you can see how impossible it is to vet every post that is posted on an internet forum and, when you are facing getting witnesses to prove facts behind sixty-some posts, it is an enormous burden. In our case, as our opponents found out that we had witnesses to prove certain facts, they removed the related posts from their claim. In fact, they waited until the day of the trial when they knew for a fact that David Icke was coming, to remove the posts related to him and they tried to get the judge to block his testimony (after we had already paid for his flight and accommodations). In their haste, they forgot to remove ONE of those allegations so he testified. But, that is how it went all the way through the trial. The strategy was NOT to attack Richard Warman's character. We focused on proving facts related to specific posts, and we went as far as we could in trying to persuade the jury that the posts were not defamatory, but our hands were tied there. The judge is in charge of giving them the law and the definition of defamation that he gave them would encompass any negative comment. It was "any communication that is likely to lower that person in the estimation of reasonable people and in particular to cause that person to be regarded with feelings of hatred, contempt, ridicule, fear, or dislike." We were not allowed to refer to any case law that gave a broader definition, and the judge specifically refused to give the jury case law relating to the extra latitude that should be given to "political speech". I was stopped from giving my opinion as to how comments are interpreted in an online forum context because I was not an "expert witness", and every time I tried to explain the context of an anonymous comment or what I thought was the motivation behind a post, I was not allowed to continue. Anyway, you can only go so far when the judge has the final word on the evidence the jury will be allowed to see. The only recourse when you feel the jury was not properly instructed is to appeal. 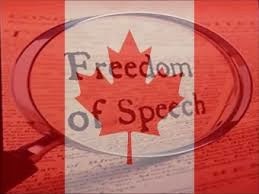 The right to speak our mind in real life situations and/or to type words in cyberspace is a unique freedom cherished by Canadian citizens, but now freedom of speech in under threat because of the misguided verdict in the “Warman vs Fournier et al” trail. Now in 2013, any self-appointed censor can rely on their JUST US system to censor blogosphere debates on any topics or issues. This is evidence that political correctness has morphed into a totalitarian monster that must be tamed. Our inate right to speak our honestly held opinions without fear of being sued or saddled with a gag order must be restored for ourselves, our children, and, our grandchildren. As it stands now, our right of free expression as granted by the Charter of Rights is being trumped by outdated, libel law, with its attached punitive consequences. All Canadians now will suffer an extreme injustice because of fatal flaws in Canadian jurisprudence. This is because under Canada's libel law there is more protection for the Plaintiff than for the Defendant, as the burden of proof has become the responsibility of the Defendant to prove that any typed words in cyberspace do not damage the "honour" of another individual. Based on the jury verdict in the "Warman vs Fournier et al," Canada's defamation laws now permit a Plaintiff to abuse and harass a Defendant - who has little or no fair recourse in their tainted JUST US system. Links to other wesbites where the Verdict of the "Warman vs Fournier et al" trial is being discussed. Appeal or Close Free Dominion?